BACKGROUND: Gastric gastrointestinal stromal tumors (GISTs) are rare neoplasms that require excision for cure. Although the feasibility of minimally invasive resection of gastric GIST has been established, the long-term safety and efficacy of these techniques are unclear. Hereby we present our experience of laparoscopic management of gastric GIST. METHODS: All patients who were managed for GIST during an eight year period were analyzed. Subgroup analyses of patients with Laparoscopic management of gastric GIST were analysed. RESULTS: Fifty five patients were managed with GIST during a eight year period (Jan 2000 –Jun 2008). 57% of patients were males & 43% were females. Age group varied from 19-74 years (Mean 39.5 years).Stomach was primary site in more than 30 cases (54%), followed by small bowel 37% & rest in 9%.Median tumor size was 9.5cms. Most common mode of presentation was dyspepsia, upper abdominal pain & bleeding. Upper GI Scopy was done in all cases. Total of 18 patients underwent attempted laparoscopic excision. Complete laparoscopic excision was possible in 72% of cases. Gastric body was the most common tumor location in 16(53.3%), Antrum 6 (20%), cardia & pylorus 4 each (13.3%). 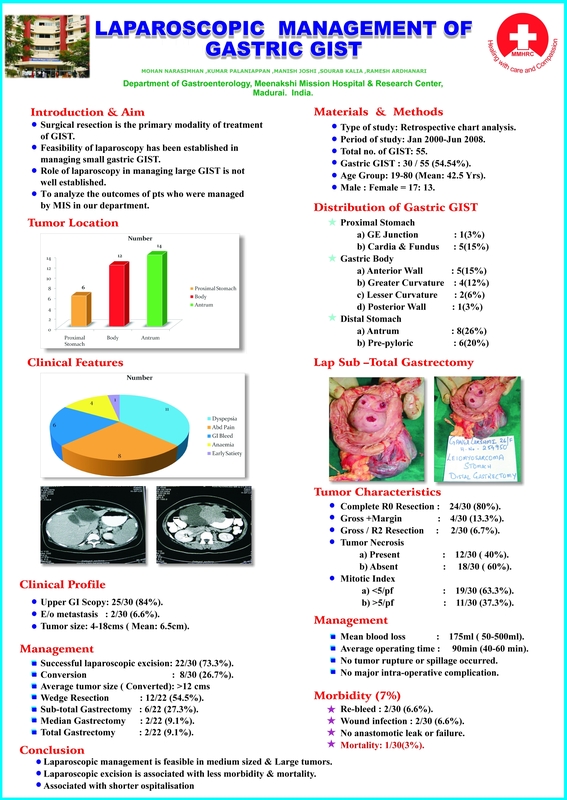 Complete gross tumor excision was feasible in 77.7%. The surgical procedures undertaken were subtotal gastrectomy in 12(40%), total gastrectomy with Multiorgan resection in 6(20%),wedge resection in 10(33.3%), mid body excision with Laparoscopic gastro gastric anastomosis in 2 cases (6.6%). Mean operating time was 110 min (90-270 min).Mean blood loss was about 230ml (150 – 1100ml). Two patients required re-exploration for re-bleed. Mortality was noted in one patient (3.3%). CONCLUSION: A laparoscopic approach to surgical resection of gastric GIST is associated with low morbidity and short hospitalization. As found in historical series of open operative resection, the tumor mitotic index predicts long term tumor free recurrence. In view of above findings as well as the advantages afforded by minimally invasive surgery, a laparoscopic approach may be the preferred resection technique in most patients with small- and medium-sized gastric GISTs.